Chronic kidney disease-mineral bone disorder (CKD-MBD) is a systemic disorder of mineral and bone metabolism. In patients undergoing peritoneal dialysis (PD), serum levels of calcium (Ca), phosphate (P), and parathyroid hormone (PTH) remain relatively constant, irrespective of the timing of treatment. This is because PD is a continuous blood purification procedure, and in this respect differs greatly from hemodialysis (HD), where the serum levels of these factors change following each dialysis session, and so pre-dialysis values are considered baseline values. Nevertheless, the target values for serum P, Ca, and PTH in PD patients are the same as those in HD patients. In PD patients, however, it is plausible to initiate correction of any of these values once any tendency towards worsening is observed, even if they are still within the upper limit of normal for HD patients. Restriction of dietary P intake, conservation of residual renal function for excretion of P, and prescription of an appropriate P binder are recommended to maintain the blood P level in the appropriate range. The use of a 2.5-mEq/L Ca concentration dialysate reduces the risk of hypercalcemia and allows correction of adynamic bone disease. Meanwhile, secondary hyperparathyroidism may progress in such cases. It is thus recommended that this factor be considered in prescribing this type of dialysate. Chronic kidney disease-mineral bone disorder (CKD-MBD) is a systemic condition that manifests as abnormalities in parathyroid hormone (PTH), calcium (Ca), phosphorus (P), and vitamin D metabolism, with associated bone abnormalities and ectopic calcification ; it is a major complication in patients undergoing peritoneal dialysis (PD) . CKD-MBD is associated with vascular calcification and cardiovascular disease (CVD), and these conditions are closely related to an increased mortality rate . Guidelines for the treatment of CKD-MBD have been published by Disease Outcomes Quality Initiative (DOQI)  and Kidney Disease: Improving Global Outcomes (KDIGO) . Clinical practice guideline for the management of CKD-MBD for Japanese dialysis patients was recently published and was made applicable to Japanese PD patients . At the end of 2015, the number of PD patients in Japan was 9322, slightly higher than in 2014 . The clinical relevance of CKD-MBD has led to the identification of clinical biochemistry targeted to be achieved to improve the outcome of PD patients. The purpose of this paper was to review the literature concerning the management of CKD-MBD in PD patients. Abnormalities in serum Ca and P levels are independent risk factors influencing survival prognosis in PD patients. A Dutch prospective survey revealed a significant increase in the risk of CVD-related death in PD patients with a serum P level of ≥ 5.5 mg/dL and serum Ca×P product of ≥ 55 . Blood purification via PD involves continuous, slow dialysis as compared with hemodialysis (HD). Therefore, blood levels of Ca, P, and PTH remain relatively constant in PD patients. In HD patients who have marked fluctuations in serum Ca and P levels, the pre-dialysis serum Ca and P levels, determined at the beginning of the week when the patients’ condition is poor due to the weekend break, are usually taken as a baseline. In PD patients, if serum Ca, P, and PTH levels appear to be worsening even slightly, then that is considered the patients’ status at all times. Ultimately, if any value in a PD patient deviates from the baseline values, intervention should be initiated promptly, with further investigation and close monitoring of changes in serum Ca, P, and PTH levels over time. 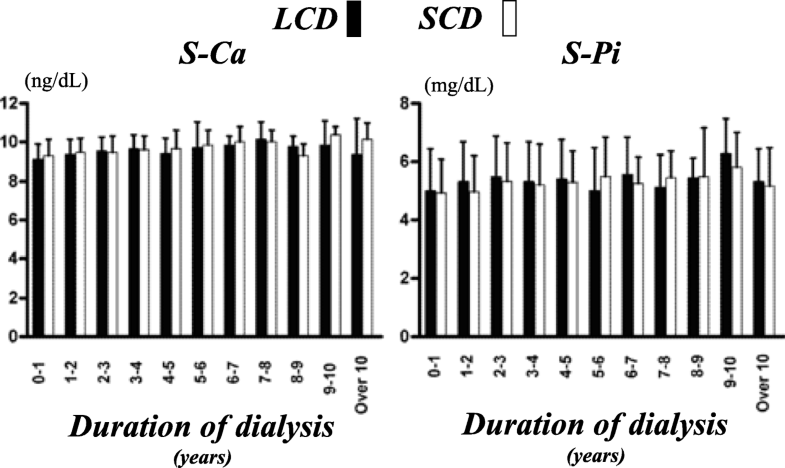 According to the Dutch survey , the risk of death from CVD due to hyperphosphatemia was significantly higher for P concentrations above the K/DOQI threshold in PD patients (2.4-fold) and in HD patients (1.5-fold), suggesting the importance of strict mineral management in PD patients. Percentage achievement of the K/DOQI guideline for CKD-MBD markers is based on plasma concentrations at 3 months after the start of dialysis treatment in the Dutch survey (Fig. 1). In PD patients, transperitoneal removal of P is at a rate of approximately 200 to 300 mg per day, so it is difficult to maintain appropriate serum P levels using PD alone. It is thus important in such cases to restrict dietary P intake to conserve residual renal function for P excretion and to then prescribe an appropriate P binder. PD utilizes a biomembrane and is dependent on residual renal function with regard to solute removal; therefore, the dialysis dose tends to decline over time as a result of the diminution of peritoneal function and deterioration of residual renal function . If serum P level deteriorates, therefore, it should be ascertained that the dialysis dose is still adequate. PD dose is determined in terms of the dialysis adequacy indicated by urea Kt/V per week (weekly Kt/V). 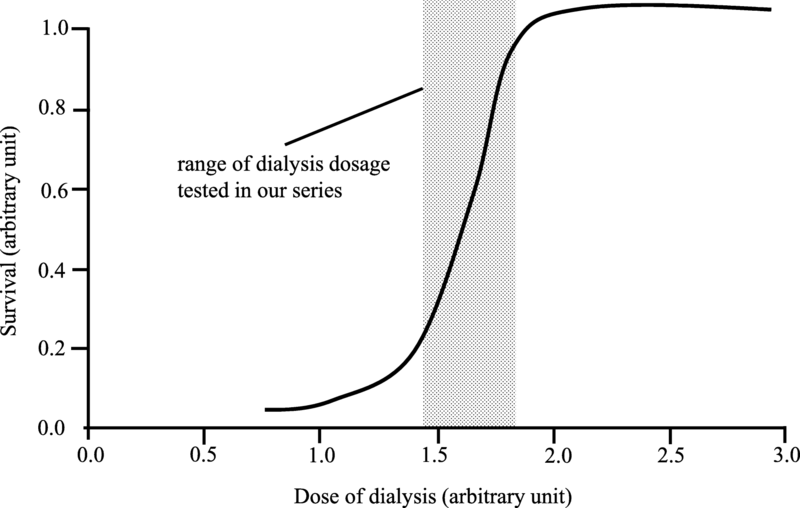 The dialysis dose may be assessed as satisfactory when the Kt/V is ≥ 1.8 and should be maintained at a minimum of 1.7 as combined with residual renal function [10–12]. Theoretically, patient survival and morbidity have a dose-dependent relationship with small-solute clearance (Fig. 2) . Meanwhile, excessive Ca loading due to the use of Ca-based P binders may lead to vascular calcification and calciphylaxis, stressing the need for precautions against the development of hypercalcemia [13–16]. It is also important to exercise great caution when using drugs such as sevelamer hydrochloride [17, 18], lanthanum carbonate [19, 20], and cinacalcet hydrochloride , which are liable to induce gastrointestinal symptoms in patients at risk of gastrointestinal obstruction. According to previous reports, abdominal symptoms occurred in 18% of patients receiving sevelamer hydrochloride and 16% of patients receiving lanthanum carbonate. Peritoneal calcification seen in PD patients may reflect vascular calcification and mineral metabolic disorders. However, in most instances, this is not associated with these disorders but reflects advanced impairment of peritoneal tissues . A hypothetical dose-dependent relationship with small-solute clearance in PD patients . Theoretically, patient survival and mortality have a dose-dependent relationship with small-solute clearance. Several cohort studies found that a higher dialysis dose was associated with better patient survival and fewer hospitalizations. Based on the results of those studies, DOQI Workgroup recommended a total weekly Kt/V of 2.0 as target for adequate PD. Adynamic bone disease (ABD) resulting from low serum levels of PTH is now recognized as a common complication in PD patients . Carmen Sánchez et al. reported that ABD was found in 63.2% of PD patients and that PTH levels less than 150 pg/mL in patients with ABD showed a sensitivity of 91.6% and specificity of 95.2% . Moreover, de Oliveira et al. have recently shown that sclerostin, a Wnt/β-catenin pathway inhibitor that decreases osteoblast action and bone formation, seems to participate in the pathophysiology of ABD, and bone alkaline phosphatase was the sensitive serum marker of bone turnover in these patients . This condition depends mainly on the Ca concentration in the dialysate and the use of active vitamin D preparations, and at present, there are no known bone lesions peculiar to PD patients. Initially, PD fluids simply contained positive Ca dialysates with a Ca concentration of 3.5 mEq/L. Then, in 1990, a low Ca concentration dialysate with a negative Ca balance (2.5 mEq/L) was introduced. This type of dialysate was produced with the aim of enabling sufficient use of Ca carbonate and active vitamin D preparations while avoiding serum Ca elevation. The current dialysate has a Ca concentration of 2.5 mEq/L and is used from the initial phase of PD. As a result, the incidence of hypercalcemia and low bone turnover have both decreased compared with that in cases where dialysates with a Ca concentration of 3.5 mEq/L are used, but the incidence of high bone turnover due to serum PTH elevation has been increasing [26, 27]. In a cross-sectional observational study conducted in Japan, comparison of patient groups receiving dialysis with a 3.5-mEq/L or 2.5-mEq/L Ca concentration dialysate, stratified according to the duration of dialysis, revealed that the proportion of patients receiving Ca carbonate and active vitamin D preparations was higher in the low-Ca dialysate group. Serum PTH levels also tended to be higher in the low-Ca dialysate group, despite the absence of any significant intergroup difference in serum Ca or P levels (Fig. 3) . These results underscore the importance of Ca and PTH management from the early phase of PD and suggest that adjustment of the Ca concentration in the dialysate should precede pharmacotherapy in terms of the order of priority of treatment. With this background, the use of a dialysate with a Ca concentration of 3.5-mEq/L should be considered, particularly in order to avoid hypocalcemia in the introductory phase of dialysis. Prescription of a dialysate with a Ca concentration corresponding to the serum level in each patient undergoing PD is feasible, unlike with HD where the access is via the central vein. Mineral management should therefore take advantage of the characteristics of PD, in which personalized therapy is readily practicable. For example, the efficacy of cinacalcet for secondary hyperparathyroidism during the maintenance phase has been also demonstrated in PD patients . Abdominal aortic calcification (AAC) has been reported as a predictor for CVD events in HD patients. Martino et al. 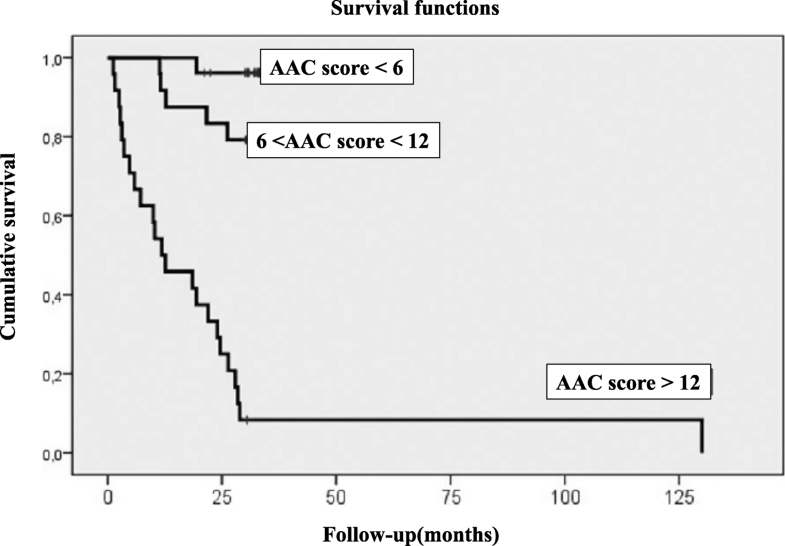 were the first to show the predictive value of AAC for the outcomes in PD patients (Fig. 4) . A total of 74 Italian PD patients were followed for a median of 30.5 months, during which there were 29 CVD events (39.2%). In multivariable regression analysis, AAC score stratified by tertiles was the only independent predictor for CVD events. Also, Makela et al. recently shown that severe AAC was a strong predictor of all-cause mortality and CVD events in PD patients, while PD patients with normal AAC scores had more favorable outcomes . Older age, low serum albumin level, and diabetes were also independently associated with increased all-cause mortality. Risk stratification by assessment of AAC score may provide important information for the management of CVD in PD patients without any additional expense because these patients undergo several abdominal X-ray scans to evaluate the catheter position. 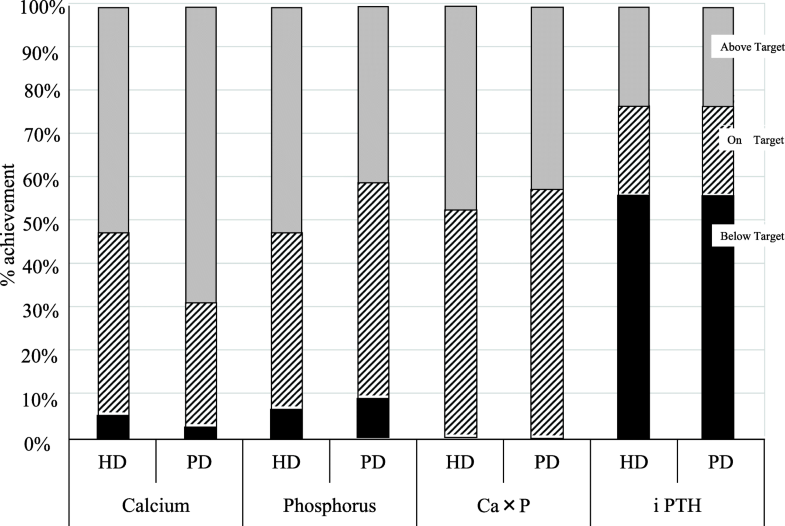 The most important methods for the prevention and treatment of vascular calcification are dietary P restriction and adequate use of P binders for hyperphosphatemia. The severe vascular calcification associated with hyperphosphatemia is a result of the phenotypic conversion of smooth muscle cells to osteoblasts . The KDOQI recommends a target of P < 5.5 mg/dL, while KDIGO recommends normalization. There are several commercially available P binders that are invariably equally effective. These can either be Ca-containing (Ca carbonate, Ca acetate) or Ca-free (sevelamer hydrochloride, lanthanum carbonate, magnesium carbonate). Furthermore, the iron-containing P binder such as ferric citrate hydrate and sucroferric oxyhydroxide has recently been marketed. Hypomagnesemia has also been found to be associated with increased mortality in PD patients . Molnar et al. have recently shown that lower serum magnesium is associated with vascular calcification in PD patients . Magnesium carbonate may thus be useful to inhibit vascular calcification in PD patients with hypomagnesemia. PD is a continuous blood purification procedure and differs greatly from HD, where the serum Ca, P, and PTH levels change following each dialysis session, and pre-dialysis values are taken as the baseline values. Nevertheless, the target values for these factors in PD patients are the same as those in HD patients. In PD patients, however, it is plausible to initiate correction of any of these values once any tendency towards worsening is observed, even if they are still within the upper limit of normal for HD patients. Restriction of dietary P intake, conservation of residual renal function for excretion of P, and prescription of an appropriate P binder are all recommended to maintain the blood P level in the appropriate range. The use of a 2.5-mEq/L Ca concentration dialysate reduces the risk of hypercalcemia and allows correction of ABD. Future research in this field will shed light on several topics, including a comparison of CKD-MBD management across different countries and the relationship between dialysate Ca concentrations and vascular calcification in PD patients. These studies should be designed to overcome several weaknesses in the literature, such as a lack of information on gender, ethnicity, and prescription of P binders such as magnesium carbonate, all of which may influence the grade of vascular calcification and osteoporosis. In addition, high-glucose PD solution may lead to low-turnover bone, and further studies are needed to explore whether it is true or not. Moreover, continuous renal replacement therapy may be associated with a change in bone metabolism or vascular calcification. While a loss of circadian rhythm is a characteristic of secondary hyperparathyroidism, a continuous replacement therapy will affect the PTH level. Updated clinical practice guideline for the management of CKD-MBD in Japanese dialysis patients will be published in the near future. The authors acknowledge all the medical staff who contributed to this work in the Departments of Nephrology and Blood Purification, Tokyo Women’s Medical University. KN searched the literature and prepared this article. KN, NH, and KT read, criticized, and approved the final manuscript.